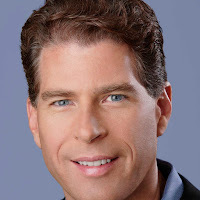 "Dr. Love" scientist, entrepreneur &author of several books including, Trust Factor & The Moral Molecule. Trust is the secret ingredient of high performance organizations. Dr. Zak describes the science and applications of a management tool he developed called Ofactor that has been used by numerous organizations to increase trust between colleagues and improve the bottom line. It is based on the latest brain science developed in his lab. He describes an eight step trust-boosting program that every organization can use. In a surprising twist, he shows why high trust organizations have happier and healthier employees. It's not rocket science, but it is neuroscience. Read this piece and watch this video for more information. Is there a "buy button" in the brain? This engaging talk describes why people not only watch ads, but will change their behavior in response to ads. It describes pioneering by Dr. Zak that has established the scientific basis for neuromarketing. He describes how he applied the science to guide high-profile ad campaigns ranging from super bowl commercials, to the 2014 Winter Olympics, to save driving public service ads, to information operations for the U.S. Department of Defense. This talk also reveals why there are puppies in toilet paper commercials. Throughout this talk, Dr. Zak provides specific ways to apply the principles of neuromarketing to your business. 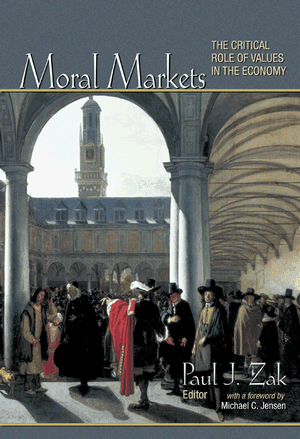 Dr. Zak's new book shows how an ancient molecule, oxytocin, is the foundation for morality, civilization, and global commerce. In this fun romp in which Dr. Zak takes blood samples in weddings, concerts, and religious services, the essence of human nature is revealed. Evolution does not promote happiness. Most creatures live on the edge of survival and do whatever it takes to get through another day. Yet, many human beings seek to be, and often are, happy. How did that happen? Dr. Paul Zak's discovery that oxytocin functions as a moral molecule, led him to investigate the biology of happiness. His experiments show that oxytocin significantly improves happiness and health. He then used himself as a test subject to "hack" his happiness. This engaging and practical talk shows how we can embrace our biology to live better, healthier, and happier lives. Paul Zak’s two decades of research have taken him from the Pentagon to Fortune 50 boardrooms to the rain forest of Papua New Guinea. All this in a quest to understand the neuroscience of human connection, human happiness, and effective teamwork. His academic lab and companies he has started develop and deploy neuroscience technologies to solve real problems faced by real people. His book, Trust Factor: The Science of Creating High Performance Companies (2017), uses neuroscience to measure and manage organizational cultures to inspire teamwork and accelerate business outcomes. 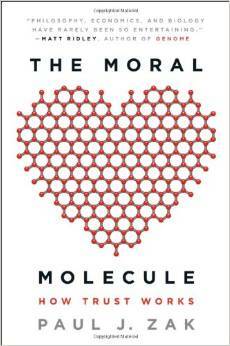 His 2012 book, The Moral Molecule: The Source of Love and Prosperity, recounted his unlikely discovery of the neurochemical oxytocin as the key driver of trust, love, and morality that distinguish our humanity. In another obsession, Paul’s group uses neuroscience to quantify the impact of movies, advertising, stories, and consumer experiences. Along the way, he has help start several transdisciplinary fields, including neuroeconomics, neuromanagement, and neuromarketing. Paul is the founding Director of the Center for Neuroeconomics Studies and Professor of Economics, Psychology and Management at Claremont Graduate University. He has degrees in mathematics and economics from San Diego State University, a Ph.D. in economics from University of Pennsylvania, and post-doctoral training in neuroimaging from Harvard. You can check out his academic lab, consumer neuroscience company, and neuromanagement company.